If you've ever tried to learn out of body travel, also known as astral projection, you know inducing the experience is not an easy task. This guide will walk you through the process of experiencing what people describe as out of body travel. Why Learn Out of Body Travel? The act of psychically exploring not only other locations across the world, but also other times and other dimensions, can be an uplifting and revealing experience. Many people enjoy amazing adventures throughout time and space via the process of out of body travel. What Causes Out of Body Experiences? What Does an Out of Body Experience Feel Like? The following procedure outlines how you can develop the ability to astral travel at will. Astral travel is another term used for having an out of body experience (OBE) where you spiritually travel elsewhere while your body stays in one place. The target technique described below is adapted from the advice of William Buhlman, the author of the book, The Secret of the Soul. If you are interested in fully developing your innate ability to travel spiritually outside of your body, this book is an excellent place to start. Many experts believe that the core of the human soul is based upon the overpowering emotions you feel throughout your life. It's easier (and healthier) to focus on positive emotions, so choose three objects that are extremely meaningful to you. These could be a particular picture in your home that brings back very happy memories or a trinket or piece of jewelry that someone you love a great deal gave to you. Once you've identified the three objects that have the most emotional power and meaning for you, you're ready to move on to Step 2. Set aside meditation time every day to learn out of body travel. Create a relaxing environment with either absolute quiet or with meditative background music. Lie down on your bed with your arms by your sides. Next, breathe deeply and slowly, and examine every part of your body to determine if it's fully relaxed. If you find a part of your body that's in pain, such as your neck or your back, stop there and observe the pain. Recognize that the pain is there, stop resisting it, and simply allow it to pass through you, fully relaxing that part of your body. Repeat the process very slowly throughout the rest of your body. This process can take up to 30 minutes or more, so be very patient with yourself; this will enhance your ability to travel outside of your body. Once you're fully relaxed, you're prepared to practice exploring with just your spirit. Keeping your eyes closed, visualize yourself sitting up and slowly walking out of your bedroom. While you're walking, carefully observe all of the sensations that you feel along the way, such as heat, lights, colors, and even your emotions. Walk slowly through your house and walk over to your first favorite object. As you're walking, you may see other people or events going on, but ignore them and simply walk over to your object. Carefully examine the object. Turn it over in your hand and notice whether it's rough or soft. Examine the weight and any scratches or imperfections. Allow the emotions the object evokes in you to pass through you and experience them fully, but do not allow your attention to drift anywhere other than that object. Next, put down the first object and slowly walk over to the second. Repeat your careful and methodical examination. Try to memorize every single observation you can make about the object. Finally, put the second object down and move on to the third one. Repeat the process of examining the object until you're satisfied you've observed and felt everything about the object. Once you've placed the last object down, walk back to your bed, lay down and once you are relaxed again, open your eyes. The session is over. At first, going through this process will be immediately calming. In time, you'll find the visualizations come easier, and your observations become more detailed and even emotional. You'll sense hot or cold, electrical charges, or even unexpected emotions and induced visions from the objects. Observe any related vision, but always bring yourself back to the object. In time, you'll have full control over these visualizations. Once you feel as though you can enter the trance and travel easily to your favorite objects, you can stop ignoring other things going on in the home. Start exploring other parts of your house, but remain within the confines of your home until you have the same level of control, and to memorize observations, as you learned during the first series of sessions. There may come a point during your visualizations that you realize you are no longer in your body. You may turn around while walking out of the room and see yourself on the bed. 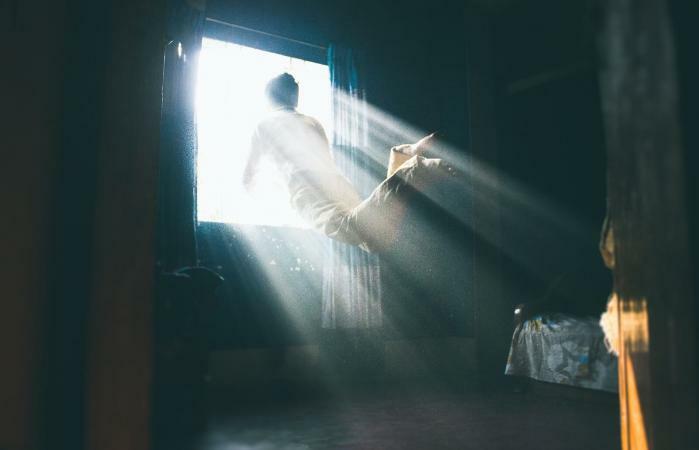 If your visualization is at a point where you feel conscious and awake, the experience of seeing yourself lying on the bed can be shocking and even scary. This fear is associated with an intense fear of dying. Once you master the ability to travel out of your body, this fear will fade, and you'll develop a greater appreciation for the continuity of life, and the fact your body is nothing more than a vehicle for your eternal soul.